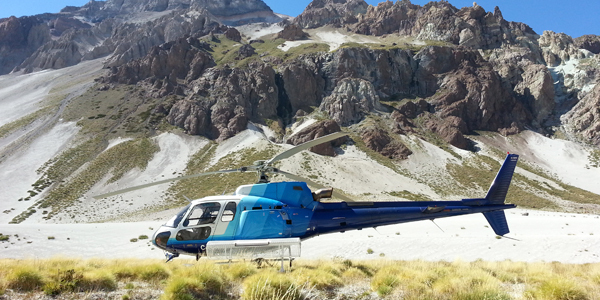 With 17 years of experience in aerial work, Discovery Air Chile puts at your disposal all its infrastructure, distributed throughout our country with its main base in Machalí, O'Higgins Region, also having secondary operations bases in Copiapó, Coyhaique and Cochrane, in order to meet the needs of all its customers. Our growth is reflected in our fleet and materialized with the support of Great Slave Helicopters (GSH), our parent company, which makes us a versatile company in the national and international market and with possibilities to evolve in more and better projects. In the year 2017, Discovery Air Chile is associated with the North American aviation company Columbia Helicopters, to complement its fleet in Chile with heavy helicopters, and thus be able to provide better services to its clients in missions of great magnitude. With our own Aeronauthical Maintenance Center (AMC) and certified by the DGAC. Certified company, with category BARS GOLD. Discovery Air realiza entrenamiento de vuelo en montaña, carga externa y de emergencias a sus pilotos. Discovery Air Innovations Chile Ltda.